The Blacksmith Buddy is a revolutionary way to train farriers and veterinarians in all major shoeing and hoof care procedures without touching a live horse or a cadaver. 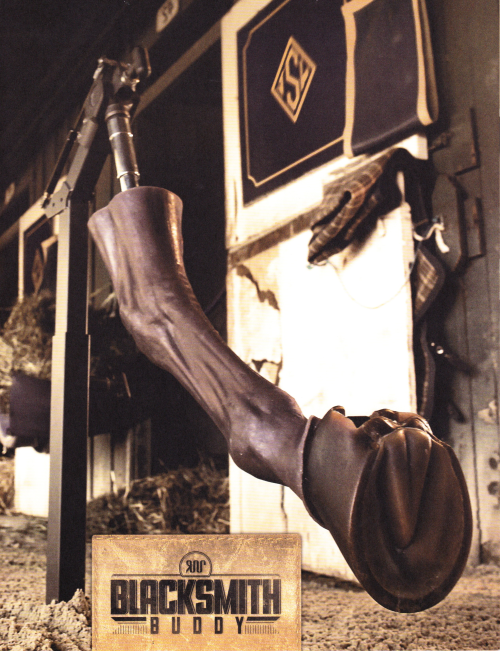 The leg is modeled after a front horse leg and is designed to attach and detach hooves with the click of a button. The Blacksmith Buddy is anatomically correct, having prosthetic joints and is weighted for tension to articulate like a real leg to simulate a live horse. While live horses can only be worked on once very six to eight weeks, the Blacksmith Buddy can be put to use anytime, anywhere. The fully recyclable hoofs can be worked on three to six times depending on the application. The product’s design even teaches proper “under the horse” positioning and develops the physical fitness required for professional fieldwork. It’s the perfect solution for trainees and apprentices of all kinds to quickly get the repetitions and expertise they need.